This is not your typical grandma's (ala Grandma's necklace) version of rope through body. Instead, this is ropes through body on steroids. It uses no gimmick rope either and everything can be examined. 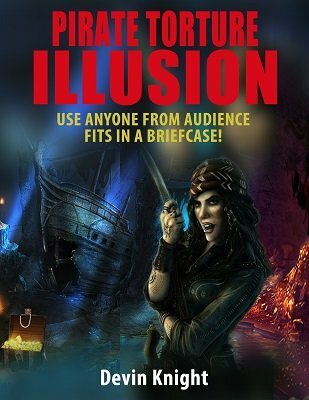 This is an illusion that fits into a briefcase and yet fills the stage with three spectators and yourself. Talk about playing big and packing small, this is the ultimate. It's based on an historical fact that pirates use to torture people for both information and for the entertainment of the crew. This is a historical fact that makes this version of the trick not only logical, but historically true. I am in complete disagreement with the way ropes through body is usually performed. Looking at this from the layman's point of view, I think it is only logical that if two ropes are placed around a person's body, then BOTH ropes should be tied. Not just one of them, as in most versions of this trick. If these two ropes could indeed, be pulled through a person's body, then two tied loops of rope should be left. Usually, two straight, untied pieces of rope are left, which isn't logical and makes no sense. What makes this version superior to other methods? Both ropes are tied around the volunteer's waist with fair knots. These knots can be tied by the two spectators helping you. Loops are pulled through the body as if they really penetrated the body. The loops are still tied and not straight ropes! No robes are necessary. No rope gimmicks are used. Everything can be thoroughly examined before and after the performance. All you need is two 12 feet pieces of rope and a piece of cardboard with a two inch hole cut in the middle and you are ready to do a show stopper that fills the stage and will fool many magicians who know the old methods. Superior in every way! The patter story deals with an authentic form of torture used by pirates to break or crack someone's spine and it looks just like the ropes through body illusion. Finally, a logical reason for doing this, showing an authentic torture method, that magician prevents from harming the volunteer. The true story will have audiences on the edge of their seats. Includes a comedy presentation where a drunk's wife and son try to pull him through a keyhole because he has lost his key to the deadbolt lock. If you use the old Supreme Tiger Illusion, you can now do it using a better method. Pros : Several presentation ideas, well expounded. The improved method used. Cons : I had to read several times the explanations to understand the instructions, because the figures are not drawn neatly, and there is an action not very clear. I hope there will be another version of this booklet with more precise figures, with different colors for the rope 1, the rope 2, the board, the spectator. It would be also good to put a picture of the action of the performer when he does his action with his right fingers between the loops and to explain with which part of the script this action is associated and justified. But, in spite of these comments, I recommend this booklet. New version to come?